What Would U.S. Estate Tax Repeal Mean for Me? The proposed change calls for the repeal of the estate and generation skipping transfer taxes, and if enacted would create a number of issues and planning opportunities. The Massachusetts Estate Tax Remains: Everyone in the State of Massachusetts is entitled to a one Million ($1,000,000) estate tax free amount. Married couples however, lose one of their tax free amounts, unless they build it into their planning. That is why it is so important for married couples when reviewing or creating a plan to ensure they have proper planning in place so they do not lose the second tax free amount! If you recall, when President Trump was a candidate he supported an elimination of the estate tax and no basis step-up for amounts exceeding $10,000,000. While it’s currently unclear whether the Administration now supports income tax recognition even at death or simply carryover basis, the implications are significant for liquidity planning. The proposed changes would be eliminating most itemized deductions except for charitable and mortgage interest. With a standard $24,000 deduction for married couples and limited itemized deductions, many tax payers won’t have to itemize and therefore may no longer need tax preparation services. 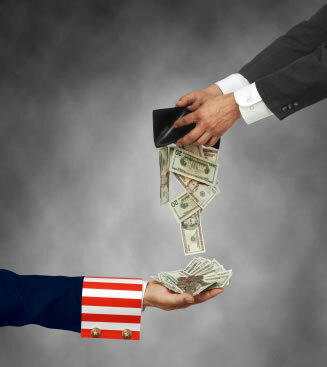 Under current law, taxable income is subject to seven tax brackets, and the Framework would consolidate the seven tax bracket system into four brackets of 0%, 12%, 25% and 35%. Although this wasn’t mentioned in the proposal, one thing the Senate has considered is a five year distribution rule. For example, this would mean that when someone passes with IRA’s worth more than a certain dollar threshold, everything would have to come out of the IRA within five years. If enacted, this would eliminate the “stretch –IRA” planning technique that has become so popular for many people. At Dennis Sullivan & Associates, we help you stay updated on proposed changes in the law! We help people and their families to ensure that independence and safety are preserved as long as possible. To learn more about how you can protect your home, spouse and life savings as well as saving on taxes and preserving your independence, Click Here to register for a free workshop today.